OSLO, Norway (AP) — The International Campaign to Abolish Nuclear Weapons won the Nobel Peace Prize on Friday, a forceful show of support for a grassroots effort that seeks to pressure the world’s nuclear powers to give up the weapons that could destroy the planet. The choice of the little-known coalition of disarmament activists put the Nobel committee again at the forefront of geopolitics at a time when fears are rising over North Korea’s nuclear and missile program and the invective it has drawn from U.S. President Donald Trump. The committee cited the tiny, Geneva-based ICAN for its work that led to the Treaty on the Prohibition of Nuclear Weapons that was reached in July at the United Nations. The group “has been a driving force in prevailing upon the world’s nations to pledge to cooperate ... in efforts to stigmatize, prohibit and eliminate nuclear weapons,” Norwegian Nobel Committee chairwoman Berit Reiss-Andersen said in the announcement. The treaty requires all ratifying countries “never under any circumstances to develop, test, produce, manufacture, otherwise acquire, possess or stockpile nuclear weapons or other nuclear explosive devices.” It also bans any transfer or use of nuclear weapons or nuclear explosive devices — and the threat to use such weapons. The nuclear powers oppose the treaty, which goes well beyond existing nonproliferation agreements, arguing that they alone should have the weapons in order to support stability in the world. The U.S., Britain and France said the prohibition wouldn’t work and would end up disarming their nations while emboldening what U.S. Ambassador Nikki Haley called “bad actors.” They instead suggest strengthening the nonproliferation treaty, which they say has made a significant dent in atomic arsenals. ICAN, a coalition of 468 nongovernmental groups from over 100 countries, says that argument is outdated. 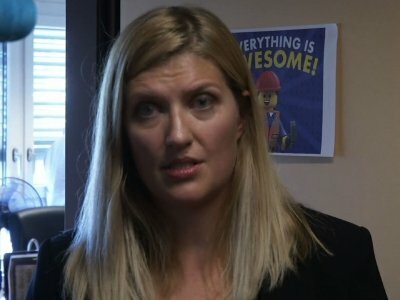 “This prize is really a tribute to the tireless efforts of many millions of campaigners and concerned citizens worldwide who have, ever since the dawn of the Atomic Age, loudly protested nuclear weapons, insisting that they can serve no legitimate purpose and must be forever banished from the face of our Earth,” said ICAN executive director Beatrice Fihn. The prize is likely to give new momentum to ICAN and its allies in the coming months as the group tries to achieve ratification of the treaty by 50 nations. That would allow the ban to become binding under international law for those countries and put nuclear-armed states in the uncomfortable position of being outliers. On Sept. 20, the first day the treaty was open for signatures, 50 countries signed it and three submitted their ratifications. Three more countries have since added their names. ICAN hopes to get the 50 ratifications by the end of 2018. Norwegian Nobel Committee chairwoman Berit Reiss-Andersen noted that international prohibitions have been set on chemical and biological weapons, land mines and cluster munitions. The five original nuclear powers — the U.S., Russia, China, Britain and France, which also are permanent members of the U.N. Security Council — support nuclear nonproliferation but boycotted the treaty negotiations. Nuclear-armed India, Pakistan and North Korea didn’t vote. ICAN has its roots in Australia but was launched in Vienna in 2007, inspired largely by another Nobel peace prize-winning group, the International Campaign to Ban Landmines. The $1.1 million prize is likely to help boost ICAN’s advocacy. It also organized events globally in 2015 to mark the 70th anniversaries of the attacks on the Japanese cities of Hiroshima and Nagasaki in World War II. Since then, the U.S. has been a leading voice against the treaty to ban nuclear weapons. The real lobbying battleground could shape up in countries like NATO member states, Japan and South Korea that have military alliances with the U.S., but where activists could be emboldened by the Nobel prize. Trump has fanned concerns about nuclear conflict, with threats against North Korean leader Kim Jong Un over the secretive regime’s tests, missile launches over Japan, and warnings that the U.S. territory of Guam could be next in the firing line. The Nobel committee wanted “to send a signal to North Korea and the U.S. that they need to go into negotiations,” said Oeivind Stenersen, a historian of the peace prize. “The prize is also coded support to the Iran nuclear deal” he said, alluding to dialogue that won curbs on Tehran’s nuclear program. ICAN’s Fihn said many were worried about Trump. “I think that the election of President Donald Trump has made a lot of people feel very uncomfortable with the fact that he alone can authorize the use of nuclear weapons and there’s nothing people can do to stop him,” she told a news conference at the World Council of Churches building that hosts ICAN’s office in Geneva. “There is no one who we can trust with the ability to destroy the entire world,” she said. Somewhat unusually for a Nobel peace prize announcement, the nuclear-armed countries were largely silent or restrained in their reaction. “Today’s announcement does not change the U.S. position on the treaty: the United States does not support and will not sign the ‘Treaty on the Prohibition of Nuclear Weapons,’” the U.S. State Department said in a statement. “Unfortunately, we are seeing a deterioration in the overall security environment and growing nuclear capabilities of certain states. This treaty will not make the world more peaceful, will not result in the elimination of a single nuclear weapon, and will not enhance any state’s security,” it said. The British and Russian governments did not comment. But British opposition Labour party leader Jeremy Corbyn — a long-time disarmament campaigner whose photo hangs in ICAN’s Geneva office — congratulated the group. And India sent the group tulips, said ICAN network coordinator Daniel Hogsta. “It was nice to send flowers, but we want them to sign the treaty,” he said. Keaten reported from Geneva. Associated Press writers Vladimir Isachenkov in Moscow, Jill Lawless in London, Sylvie Corbet in Paris, George Jahn in Vienna, Edith M. Lederer at the United Nations and Jim Heintz in Stockholm contributed. This story corrects that 50 countries signed the treaty the day it opened for signatures.